The Rasmussen Reports said last week that two-thirds of Americans still prefer reading newspapers over the online versions of the news. That’s a surprise. 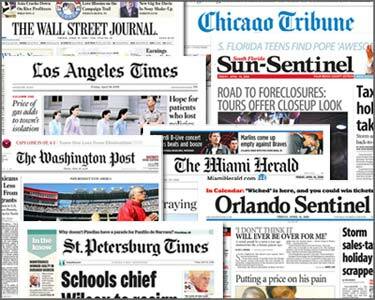 Conventional wisdom says newspapers are dying, and it’s no secret that they are financially struggling. But I suppose there’s a difference between what we prefer and what we accept. I might prefer to travel on a vacation — Vermont or Switzerland would be nice — but I’ll accept a “staycation” if I need to. So I wonder if people prefer paper but accept online news. After all, it’s usually cheaper than a newspaper subscription, sometimes even free. The Internet has made the old business model for newspapers obsolete: Paper is the most expensive part of the production cost. Ad revenue, especially from the once-lucrative classifieds, is flowing away from newspapers like a mountain stream. A lot of people produce a lot of content for a lot less money (sometimes even for free). Bottom line: It’s getting harder and harder for newspapers to stay viable, and so while we might prefer paper, we’ll go with plastic and one day, it will feel normal. There was a time, after all, when getting news on radio or TV felt strange too. The economics seem to point to a day when most–but not all–literal newspapers will be lining the dustbins of history. What about you? Do you like your news on paper or … um … plastic? Feel free to comment. Next Post American. Christian. One of these is not like the other. Jim, I enjoyed reading your post. You can probably guess where I weigh in on this discussion. I agree with your point that it could be a difference between what we prefer and what we are willing to accept. But that is only a fair comparison for our generation. There is already a generation of young adults who cannot prefer print because they haven’t grown up with print newspapers in their house. It’s a choice their parents have made for them. I bring my own baggage to this discussion, but there are a couple of reasons I prefer print. I’ll admit nostalgia is a big one. When I was young, we had a morning paper at the breakfast table every day. We even had an evening paper until I was about 10 or 11 years old. I looked forward to turning to my favorite columns. I clipped articles and pasted them in scrapbooks and mailed them to friends. My dad and I traded sections, and on Sundays we raced to see who could get to the “Floridian” section first. I worked the crossword puzzles. But it goes deeper than the tangible reasons I prefer print. I sense a greater level of accountability when something is printed in ink under a particular paper’s masthead. A newspaper’s reputation can be made or broken with those black and white stories delivered to the door. Before I became a reporter and started having nightmares about correction scenarios, I even loved reading the “correction box.” When a mistake was made, the CORRECTION (in all of its bold presence) would run the next day. There was no doubt about what had been written; you could just pull out yesterday’s issue and there it was, as it was first reported. Yes, there are wonderful online news sources. But there are also distractions and a bunch of junk. For people who often glean the “news” from sound bites, Twitter posts and People magazine, I worry that the reputable online news sources and credible online newspapers often get lost in the barrage of information and rants. Here’s my most shocking admission — this old-fashioned stick in the mud gets most of her news online. I appreciate being able to go online and read newspapers other than my local paper. But here’s the distinction: I was brought up reading newspapers every day, and I learned the value of reading and processing the news. I fear that with the demise of the print edition as part of our daily lives, we will lose great opportunities to teach our children to engage in what’s going on around them. I doubt my kids know or care what I read online, but when they see the newspaper with a headline they don’t understand, they ask me about it. We discuss it. As they grow older and gain more computer privileges, I cannot guarantee they will spend the majority of their computer time reading news sites. There are so many other enticements. But I can guarantee that as long there is a print edition of our local paper, we will have one at the kitchen table. And I hope that more than the ink will rub off on them. Thanks for the good comment, Melissa. I feel some tension, personally, about this issue. Like you, I grew up reading and loving newspapers, and I think the medium makes a difference in how we treat it and how we think about its content. (The medium is the message, right?) So I agree with you: there is something about a newspaper. Some of your memories sound very familiar. On the other hand, the writing is on the wall (no pun intended), thanks to the economics of publishing as well as the changes that come from one generation to another. (My grandmother came of age when radio was starting to mushroom in popularity. My mother was born the same year as LIFE magazine and then witnessed the takeover by TV in the 1950s.) So I think the challenge is to capture the strengths of newspapers that you mention (a sense of permanence, accountability, the ability to share content easily and “humanly,” etc.) and somehow apply them to digital media, as well as taking advantage of digital’s potential. I don’t know if that’s possible, since each medium does operate in its own way and we use them in distinct ways. There’s a reason we’ve never seen any media form go away, even when new media are invented. Up until now, media have adapted (or we’ve adapted them, I guess); they haven’t gone extinct. I hope that’s the story of newspapers. I’d hate for newspapers to be the first.